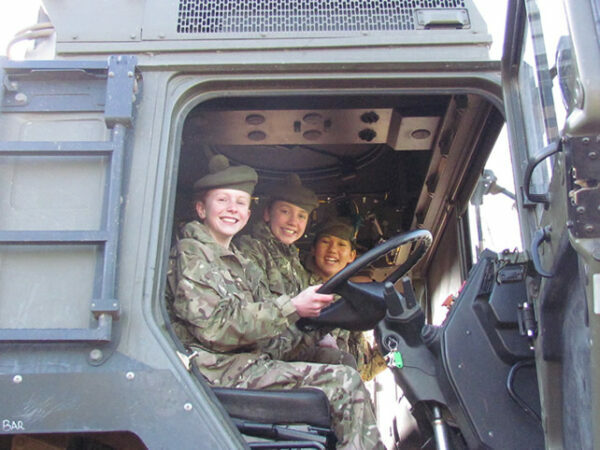 On 22 March, a team of 10 cadets travelled down to Welbeck Defence Sixth Form College in Loughborough to compete in the Annual STEM Leadership Challenge. The team have now returned to Dollar after successfully winning the competition. The group, led by Andrew Hynd (Form IV), consisted of cadets aged 13-15 years old. The challenge is designed to test the cadets’ leadership, communication and teamwork skills through a range of physical and mental challenges. This year saw a record number of entrants with over 250 cadets competing from all over the UK. The Dollar cadets showed strength and determination, and completed tasks in code-breaking, orienteering, engineering, climbing and obstacle courses. Throughout the tasks, the team kept their enthusiasm and morale high and their teamwork was commended by the Directing Staff. In one particular task, cadets were asked to recover a Landrover with a Regular Army Man Crane, capable of lifting 50 tonnes of equipment. The team ensured that they recovered the Landrover and safely stowed all equipment at breakneck speed. The commitment to training in the weeks prior to the competition and cadets’ determination throughout the weekend resulted in a well-deserved win, with the Dollar team beating the runners up by a clear margin. Well done to all of the cadets and staff involved in this terrific achievement. ©2019, Dollar Academy. All rights reserved.